"The following are the latest risk figures for PML as a result of being treated with natalizumab. Please note that the embedded slideshow is for health professionals only; I have been told by Biogen-Idec that if you are not a health professional you should not be reading it. if you are a MSer you should be reading my previous post designed for you." "As of 4th February 2014 there have been 439 cases of natalizumab-associated PML; an increase of 9 cases from last month. The mortality associated with PML in this setting is currently 23%, i.e. 101 MSers have died as result of PML, The majority of the PML survivors have a poor functional outcome. You need to keep these figures in context of over 123,000 MSers have been treated with natalizumab." "It is becoming increasingly clear that the numbers of MSers developing PML are falling due to the successful risk mitigation strategy that has been implemented Biogen-Idec with JC virus serological testing." In addition to this is appears that titres or levels of anti-JCV antibodies also play a role in risk (see below) and this needs to be incorporated into future risk models." "We have developed a simple infographic to help you intergrate all this information. You can download and print this infographic for your own information." Objectives: In MSers treated with natalizumab, the presence of anti-JCV antibodies (JCV Ab+), prior use of immunosuppressants (IS), and increased duration of natalizumab treatment, especially greater than 2 years, are known risk factors for progressive multifocal leukoencephalopathy (PML). With polyomaviruses, higher levels of antibodies have been correlated with increased viral burden and increased disease risk. It is not known whether JCV Ab levels correlate with PML risk in natalizumab-treated MSers. 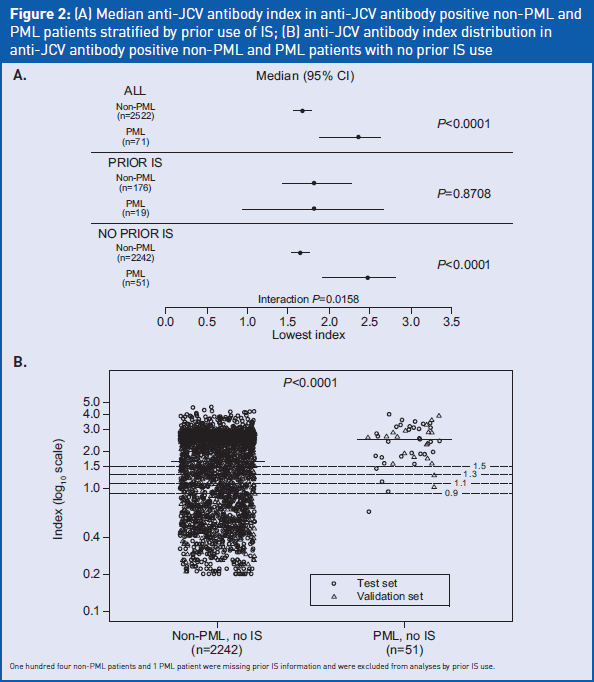 The objective of this analysis is to examine the association between JCV Ab index (JCV antibody level as measured using the STRATIFY JCV DX Select assay) and PML risk in natalizumab-treated MSers. Methods: Analyses involved JCV Ab index data from JCV Ab+ MSers enrolled in clinical studies or clinical practice. A cross-sectional analysis of JCV Ab index data from MSers without PML was first performed to assess potential relationships between JCV Ab index and known risk factors (natalizumab treatment duration <=24 vs >24 monthly infusions and prior IS use). P values were calculated using a Wilcoxon rank sum test. The association between JCV Ab index and PML was then assessed using all available longitudinal data. Odds ratios (ORs) were estimated from generalised estimating equations with a logit link. The predicted probabilities were then used to update the current PML risk estimates for JCV Ab+ MSers with high/low Ab index by applying Bayes theorem. Results: JCV Ab index data were available from 71 natalizumab-treated PML MSers at least 6 months prior to PML diagnosis and from 2522 non-PML JCV Ab+ MSers. JCV Ab index was not found to be associated with number of natalizumab infusions (P=0.39) nor prior IS use (P=0.43), but was significantly associated with PML risk (P<0.001). Estimated ORs were at least 4 for high versus low JCV Ab index in JCV Ab+ MSers. Updated PML risk estimates and longitudinal stability of JCV Ab index will be presented. Conclusion: Risk of PML in JCV Ab negative natalizumab-treated MSers is very low (0.07 per 1000). In JCV Ab+ MSers who have low JCV Ab index, the risk of PML is several-fold lower than the risk currently attributed to all JCV Ab+ MSers. Utilisation of JCV Ab index allows for further clinically meaningful stratification of PML risk in JCV Ab+ natalizumab-treated MSers. "The figures in the bottom table are derived from Table 2 above and present the data in a different way, rather as per thousand an absolute risk. You have to realise that these figures are derived from relatively small numbers, i.e. 51 cases of PML. But the data is what it is and will not be confirmed by anyone else. I assume as more cases emerge the data set will be updated. The implications of this data is that many MSers who are doing well on natalizumab and have low titres, or a low index, may choose to stay on natalizumab rather than switch. In those MSers who are high risk and have elected to stay on natalizumab we have started doing 3 monthly MRI monitoring for early signs of PML. The idea behind the latter strategy is to detect PML very early and wash-out natalizumab. It is clear that if PML is picked up in the asymptomatic phase and managed quickly MSers do much better; this is highlighted in slides 35 and 36 above."